A delicious option for vegans and omnivores alike! In my quest to wean my menfolk off their long-standing habit of eating meat every day, I’ve learned a few tricks that are proving quite effective. First and foremost is that I never announce when the meal we are about to enjoy is vegetarian or vegan. If I did, I know they’d be putting up mental roadblocks, even before they’ve tasted their first bite. This pasta sauce is a perfect case in point. It’s delicious, satisfying and filled with familiar flavours; the lentils, carrots and mushrooms also add a nice bit of texture that an unsuspecting eater might assume comes from ground meat. I’ve put this dish into regular rotation and have had zero complaints so I guess that means they haven’t figured out yet that what they’ve been consuming with gusto is plant-powered. If this dish is a hit, you might want to check out my vegan shepherd’s pie – another sneaky meatless family favourite. Have all vegetables prepped before you begin cooking. Place a large saucepan over medium heat. Add oil and let warm for a minute. Add onion and green pepper and cook, stirring often, for 3 – 4 minutes, until onion has softened. Add garlic plus a little more oil if pan looks dry and cook, stirring constantly, for 2 minutes more. Add mushrooms to pan and increase heat slightly. Cook, stirring frequently, for 4 – 5 minutes, until mushrooms have released their moisture and are beginning to soften. Add carrot and zucchini; reduce heat to medium and cook, stirring often, for 2 minutes. Add lentils, canned tomatoes, passata or tomato sauce, baking soda, seasonings and wine or water. Stir to blend then let come to a boil. Cover pot then reduce heat to medium-low and let simmer for 25 – 30 minutes, until lentils are tender. Check the sauce a few times during cooking and add another tablespoon or two of wine or water if it looks like it’s getting thicker than you prefer. When lentils are soft, taste cause and adjust seasonings as needed; reduce heat to minimum and keep covered. 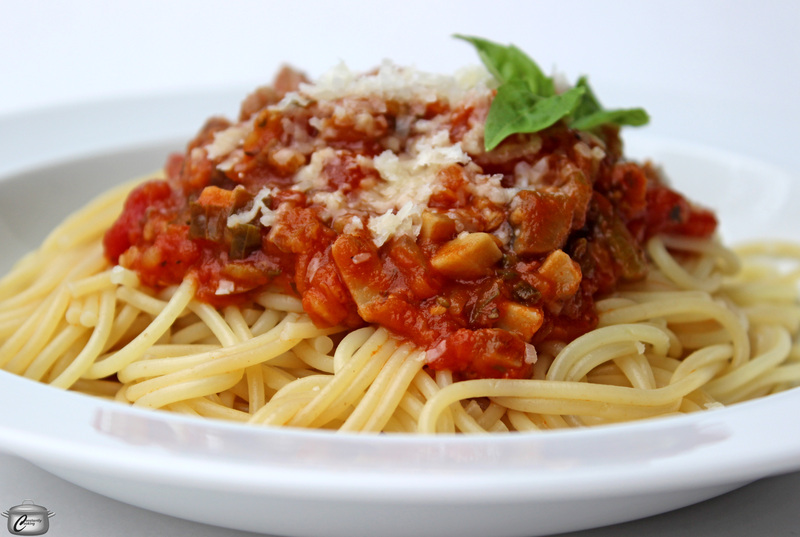 If making ahead, sauce can be refrigerated or frozen at this point and reheated when pasta is cooking. When sauce is ready, bring a large pot of water to a boil; add salt as it is warming up. Add pasta and cook until just al dente (time will depend upon shape of pasta you use). Just before draining cooked pasta, scoop out 1/2 cup of the cooking water and add to the sauce. Drain pasta, top with sauce, chopped fresh herbs and cheese and serve warm. 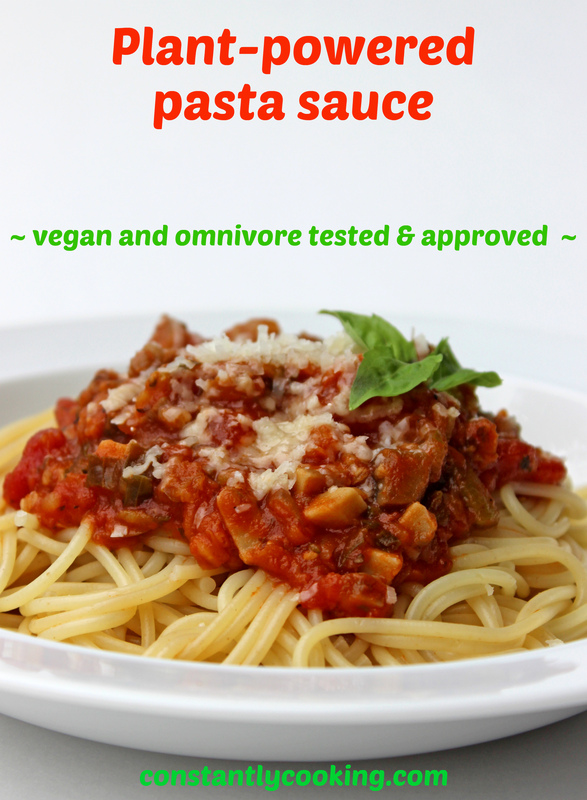 This entry was posted in Pasta, vegan and tagged baking soda in pasta sauce, great pasta sauce for omnivores, how to make flavourful pasta sauce, lentil pasta sauce, lentils, make-ahead vegan pasta sauce, meatless pasta sauce, Paula Roy, vegan, vegan pasta sauce, vegetarian, vegetarian pasta sauce. Bookmark the permalink.